The Hillyer Festival Orchestra is committed to offering the highest quality classics and "pops" musical standards in a professional symphony concert format to audiences of all ages. Orchestra and vocal music from the best of Broadway, film, and Big-Band literature presented in a fun, Boston Pops-like atmosphere, including sing-a-longs, educational comments, funny anecdotes and superlative entertainment. Effort is given to pleasing the audience with familiar favorites bringing to light special new compositions by American composers. 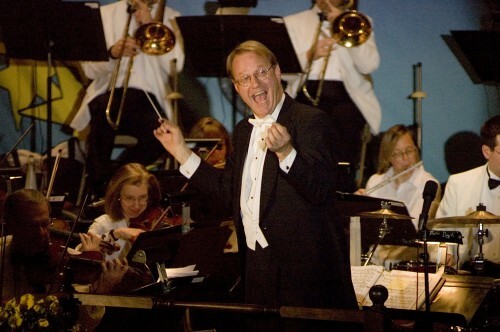 The Hillyer Festival Orchestra (HFO) was founded in 1998 by (then) Mayor Peter Torrigian of Peabody, Massachusetts. Through his generous support and kind tutelage the orchestra was commissioned to perform one Spring Pops Concert and one Holiday Concert each year. 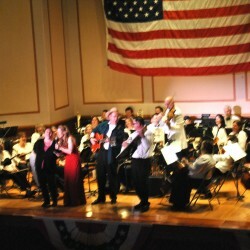 Since then, the December Holiday concerts have extended to three sold-out evenings and the series was expanded to include a Children's Concert in February, a Summer Concert on the common and various special events including a George Peabody celebration and a campaign concert for the Mayor. It has become a widely acclaimed Pops orchestra in the greater Boston area with spin off concerts in Marblehead, Salem, Lynn and for the Essex National Commission at the Hynes Auditorium in Boston. Recently, the HFO has been invited to close out the WCRB's Summer Concert Series at the Hatch Shell on the Esplanade. This has been an exciting addition for the orchestra these past three years, performing to ever increasing crowds. Such crowds already gathered on the North Shore evidence by the 15,000 plus that have attended the annual July 4th Concerts in Salem, Massachusetts for four years. A young fan at the annual 4th of July concert on derby Wharf, Salem MA. The Hillyer Festival Orchestra is committed to introducing new works and new arrangements of existing works into the pops repertory. New or seldom performed works that the HFO has performed recently include Three American Pieces by Lucas Foss, Trumpet Sonata by Rob Bradshaw, Piano Concerto by Gerard Finzi, Mascagni's Intermezzo from "Guglielmo Ratcliff", When You Wish Upon A Star arranged by Bishop, Fanfare from Mahler's "Seventh Symphony" arranged by Groth, and film music from "Silverado" arranged by Tap. The orchestra also regularly features soloists from its first chair positions. There have been recent outstanding performances by Jeff Hoefler (Summon the Heroes), Emily Roos (Composers Holiday), James Mosher (Mozart Horn Concerto #3), Karen Gahagan (Finzi's Piano Concerto). Lynn Shane (Moore's Silver Aria) and Courtenay Schowalter (Bernstein's Glitter and Be Gay). Dirk Hillyer had been putting musical groups together since he was 12 years old (his whole family would gather around the piano and entertain guests on a variety of instruments). His various configurations consisted of folk singing groups, rock groups, children's theatre accompaniment and a very popular "Tijuana Brass" style band for proms and debutante balls. He also joined a local classical orchestra when he was 13 years old which began a life's interest in serious music along with pop. So when former Mayor, Peter Torigian asked Hillyer in 1998 if he could organize his own orchestra, the response was "sure...it will be fun! We'll make a 'pops' orchestra with a little light classical and lots of american standards, movie music, Big Band greats and lets include the kids!" 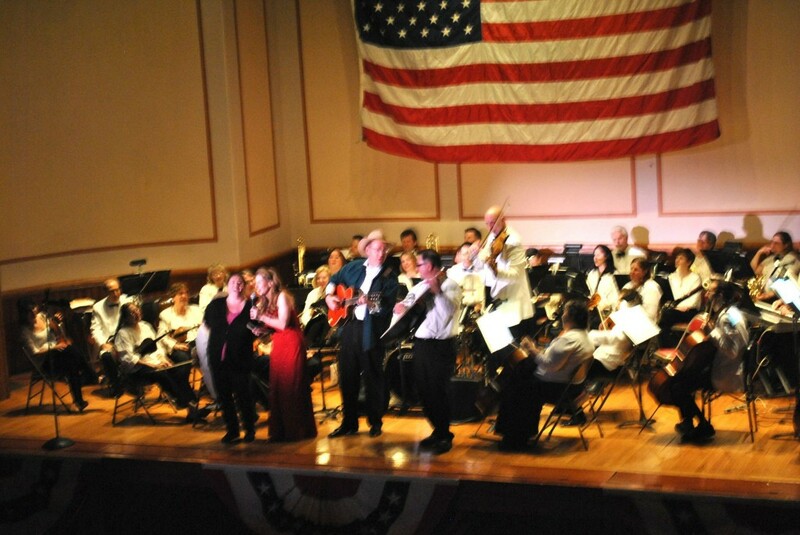 Since 1998, the Hillyer Festival Orchestra has entertained thousands of people at Salem's July 4th celebration! They are becoming a hit on Boston's Esplanade Hatch Shell Series and they love their faithful Peabody crowd. 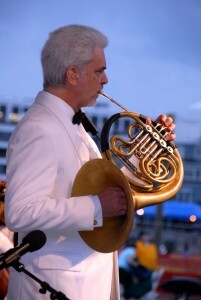 Dirk Hillyer has performed for Keith Lockhart, Carol Channing, Luciano Pavorotti, Anthony Newley, Bobby Vinton, among others and has performed in Europe on several tours. 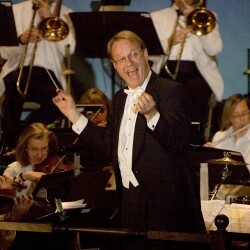 Don't miss this excellent and entertaining pops director and his fabulous orchestra! …The Hillyer Festival Orchestra and guest performers were outstanding. The grand finale was a combination of patriotic music and a wonderful fireworks display. It was like an evening at the Hatch Shell in Boston. Thank You Salem! Operetta, New England Light Opera performing “The (In)Complete Works of Gilbert and Sullivan” sounds kind of, well, light. Or even like the “G&S Amateur Hour.” But don’t be fooled: this is the same outfit that put on Franz Lehar’s The Merry Widow last year in John Hancock Hall, and that production, in the esteem of our globetrotting Arts editor, ranked up there with the 2003 Komishe Oper Presentation in Berlin and well ahead (!) of the Met’s 2000 version with Placido Domingo and Frederica von Stade. ‘Nuf said. Dirk Hillyer conducted a performance of some musical distinction, which is what a successful performance of “The Merry Widow” depends on. No wonder Gustav Mahler adored this score.